Well this is my new blog dedicated to the stuff that I am working on with Android. 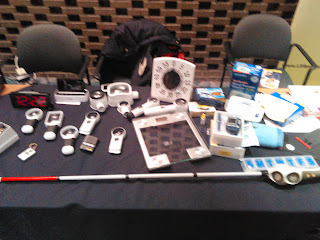 So here are some pictures from the White cane safety day that I attended at the Milwaukee VA. The highlight of the adventure was that I could try the ultrasonic cane for the blind. It worked nice but it is very expensive. I hope to use a rfDuino and Bluetooth Low Energy to experiment with a more robust aid that is more affordable. Android for people that need a little help.